1962 photo of Ferrari 250 TRI/61 S/N 0794TR at the Le Mans 24 Hours. 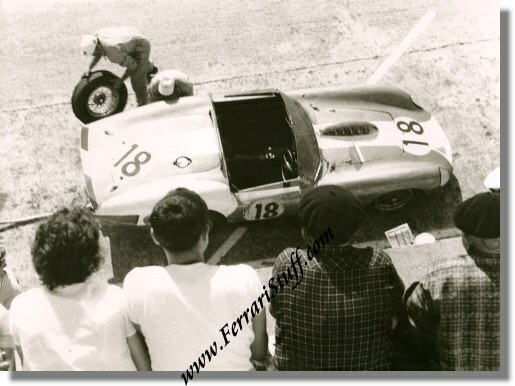 This is a modern print of the vintage negative, taken during the 1962 24 Heures du Mans, showing a pitstop of car # 18, the Ferrari 250TRI/61 S/N 0794TR, of Pete Ryan & John Fulp. This photo has never been published. For this car 1962 was the second time that it was entered at Le Mans. The car was part of Luigi Chinetti's NART and in 1961 it had won the Le Mans race, driven by Olivier Gendebien and Phil Hill. In 1962, when this photo was taken, the car crashed in lap 150 / 15th hour. The car now seems to reside in the USA. The photo measures approximately 9.4 x 7 inches.